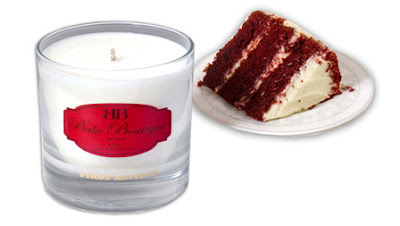 Inspired by the current popular bake: Red Velvet Cupcakes and the Bake Boutique Cake-inspired candles here is a recipe to make your own Red Velvet Cake at home – a truely delicious double layered cake. Let me know if you give this recipe a go and tweet me @perfectpolished a picture! If your looking for something more festive then check out last week's recipe - spiced gingerbread man. Preheat the oven to 180 C, 160 C fan, 350 F, gas 4 and butter and line with baking parchment 2 23cm/ 9 inch cake tins. Cream the butter and sugar together, using a handheld electric whisk or free standing electric mixer. Mix until pale and fluffy. Add the egg yolks one by one, beating well after each addition, then add the vanilla extract. Mix the flour, cornflour, baking powder, salt and cocoa together. In another bowl, mix the buttermilk with the red food colouring. Sift one half of the dry ingredients into the butter and egg mixture, pour in one half of the buttermilk and mix together. Then add the rest of the dry mixture and the rest of the butter milk until combined. Whisk the egg whites in a clean bowl until you have stiffish peaks. Add one half to the cake mix and fold in. Don’t mix too much or the air will be knocked out of the mixture. Add the rest of egg whites slowly using a folding motion. Mix the vinegar and bicarbonate of soda then fold this into your cake mix. Pour the cake mix into your lined cake tins and bake for 30 to 35 minutes. You can test if the cakes are cooked by inserting a clean knife or skewer into the middle of the cakes. If it comes out clean, then take the cakes out of the oven and leave them to cool. Whilst the cakes are cooling make the frosting. Beat the cream cheese and the butter together until combined, then add half of the sifted icing sugar. Once incorporated add the rest of the icing sugar making a smooth frosting. When the cakes have cooled spread a layer of frosting on top of one of the cakes and sandwich the second cake on top. Spread the rest of the frosting on the cake and serve.